The science of spinal manipulation therapy(chiropractic) involves the relationship between the spinal column and the nervous system and the crucial role this relationship has in the maintenance of overall health. The vertebrae of the spinal column assist in supporting the head and provide attachment points for the muscles responsible for locomotion. Nerve impulses travel from the brain down the spinal cord to all parts of the body as well as bring nerve impulses from the body back to the brain. The nervous system is responsible for initiating and coordinating movement and for integrating all the physiologic activities of the body. Most people are familiar with the term subluxation, which is an area of the spine which is slightly misaligned which prevents the correct movement of the vertebra(e). These subluxations can also impinge on nerves that exit the vertebrae which causes interference with the nerve transmission to the parts of the body innervated by these particular spinal nerves. Thus, when vertebrae are subluxated, the receptors that would normally fire will not and this causes decreased responses of both sensory and motor pathways. By using spinal manipulation to restore a full and pain-free range of motion to the joints of the spine and extremities we can increase an animal's flexibility and performance, enhance an animal's quality of life and help treat a variety of conditions that are commonly treated with drugs or surgery. Due to the spines intimate relationship with the nervous system, spinal manipulation therapy can also affect the health and function of internal organs through neuropsychological pathways. Veterinary spinal manipulation therapy (VSMT) includes all procedures where the hands are used to mobilize, adjust, stimulate or otherwise influence the spinal and paraspinal tissues with the intent of restoring or maintaining the animal's health. 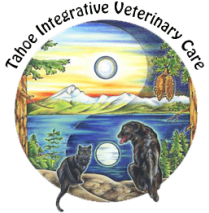 Call today to find out more or to make an appointment at our Truckee Veterinary Clinic.